There is no better way of exploring Annascaul than on foot. With so many walking and hiking trails available, you are sure to find the perfect option. There are trails to suit all levels of fitness and experience. You can join the local Annascaul Walking Club on their regular Sunday walks or choose a trail independently. Enjoy walking the three peaks of the Brackloon and the magnificent views of the Slieve Mish mountains, the Com Dubh river system, majestic Dingle Bay and the world renowned Inch beach and bay. This walk takes the walk/cycle track on the N86 from the Endurance Monument at ‘the Stage’ which was also the old Mail Coach/Dingle Train stop. Then a scenic glen walk to Inch beach and returning over the Maum road giving a bird’s eye view of Annascaul village. This is a challenging ridge walk with seven peaks and a sharp ascent and decent. 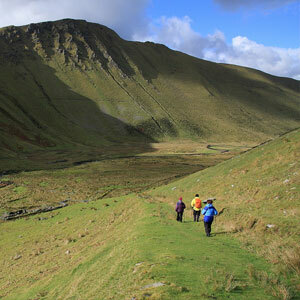 The walk affords great views of Dingle Bay, the Slieve Mish mountains, the McGuillycuddy Reeks and Tralee Bay. Start: Maumlaur Exit on the N86. This is the second stage of the Dingle Way beginning at Campvillage, through the wild beauty of the Slieve peat bogs, along the foothill overliioking Inch beach and finishing with a welcoming scenic decent into Annascaul village. This walk begins at the Tom Crean Garden walking to the old Coast Guard Station at Minard Cove, his birthplace at Gortacurrane, his final resting place at Ballinacourty Gravevard and his pub ‘The South Pole Inn’. The walk is a true homage to our most enduring polar explorer. This walk begins at the Tom Crean Garden and goes directly to his birthplace at Gortacurrane then to his final resting place at Ballinacourty Gravevard and his pub ‘The South Pole Inn’. A lovely tribute walk to our most enduring polar explorer. This walk is a loop of Acres hill starting at Minard Cove on to the overlooking the storm beach at Minard to view Dingle bay in all its majesty and a clear view to Glenbeigh and the Scellig rock. Round the heather and gorse ridge to return to the magnificent testament to nature of the Storm beach at Minard. This is an inspiring walk in the footsteps of Mary Maca na Bó) O’Donnell. The walk starts at Annascaul Lake and follows the Economic War roadway crossing the fast flowing mountain stream at the Wolf’s Crossing before descending the Maca na Bó valley to experience the nostalgic beauty of the O’Donnell homestead. Return to the Annascaul Lake, sit and enjoy the calm undisturbed beauty of area. This walk starts at Annascaul Lake and follows the Economic War roadway crossing the fast flowing mountain stream at the Wolf’s Crossing before descending the Maca na Bó valley to experience the nostalgic beauty of the O’Donnell homestead. Onto Glenahoo valley at the base of Connor Pass. Return the same route and see the very different views as you look over the lake and beyond. This walk begins at the Walking Information Board in the village and brings the walker through winding fragrant country roads and lanes to the sacred mysterious 64 acre lake nestling amongst the towering Carrigblather cliffs. This walk starts in the village and follows the Derrygorman road to the old bridge Sean Droichead where you enter the woods and follow the riverbank enjoying the sight and sound of lazy rockpools changing to rushing bubbling river to a chorus of birdsong emerging at the village. This is an archaeology walk of the Kilduff valley with Ogham stones, Standing Stones, Cross slabs, Cillín heritage and a 19th Century Graveyard. Start: Flemingstown Exit off the N86. The sculptor Jerome Connor was born in Com Dubh in 1876 among his famous works are the Luisitania Memorial Cobh, Robert Emmett Dublin, Walt Whitman Memorial Washington D.C. This trail starts at the Jerome Connor memorial on the N86 wher you have a panoramic view of the hills and landscape surrounding Jerome’ s birthplace. The trail then takes the Ballyandreen exit off the N86 following the winding road to the Stepping Stone crossing over the river. Continuing on the secluded road to Com Dubh passing the plaque marking his birthplace. The walk finishes at the village with the Jerome Connor Garden and Gallery. Start: Jerome Connor Memorial on the N86.